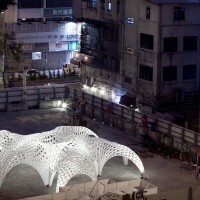 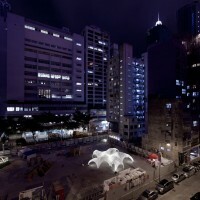 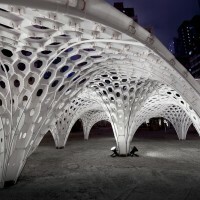 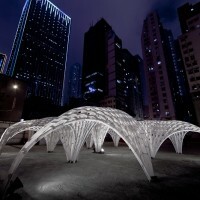 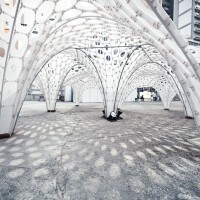 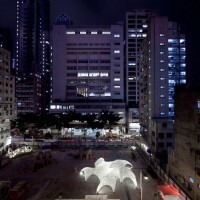 MATSYS have designed the Shellstar Pavilion in Wan Chai, Hong Kong. 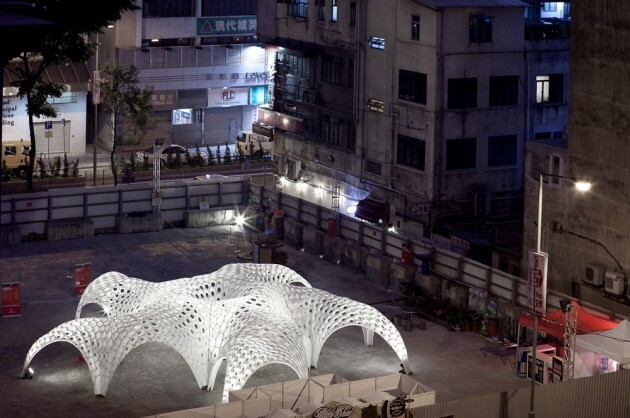 Shellstar is a lightweight temporary pavilion that maximizes its spatial performance while minimizing structure and material. 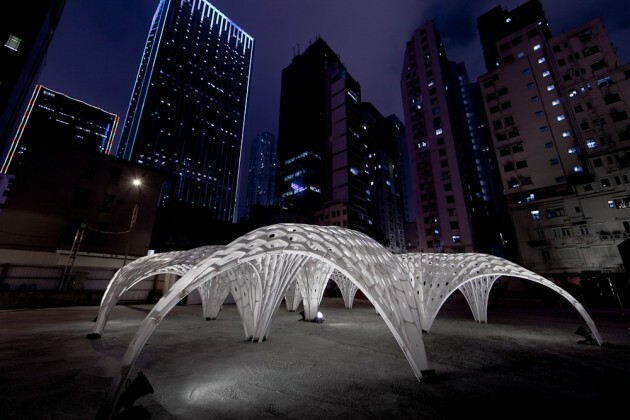 Commissioned for Detour, an art and design festival in Hong Kong in December 2012, the pavilion was designed to be an iconic gathering place for the festival attendees. 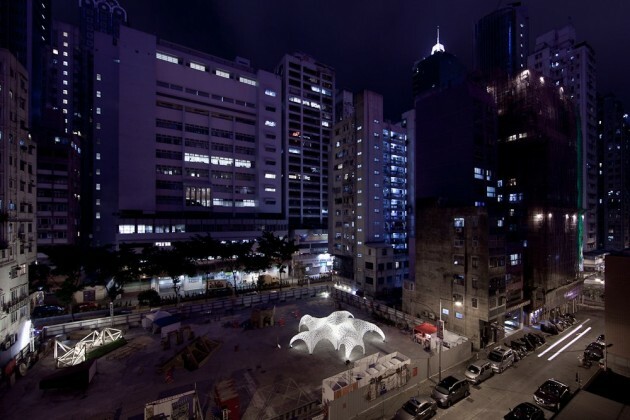 Located on an empty lot within the Wan Chai district of Hong Kong, the design emerged out of a desire to create a spatial vortex whereby visitors would feel drawn into the pavilion center and subsequently drawn back out into the larger festival site. 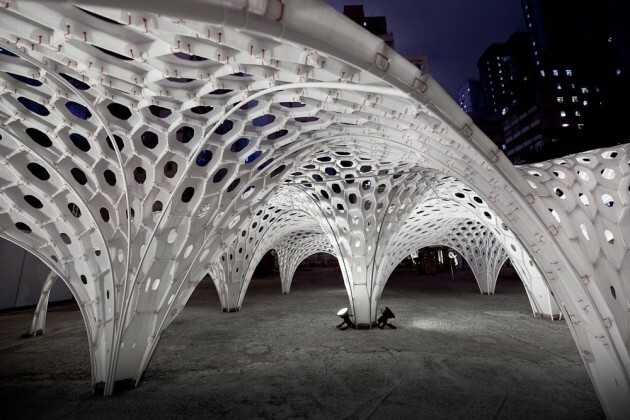 Working fully within a parametric modelling environment, the design was quickly developed and iterated with the 6 weeks of design, fabrication, and assembly. 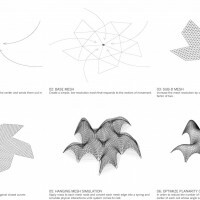 The design process can be broken down into 3 processes that were enabled by advanced digital modelling techniques. 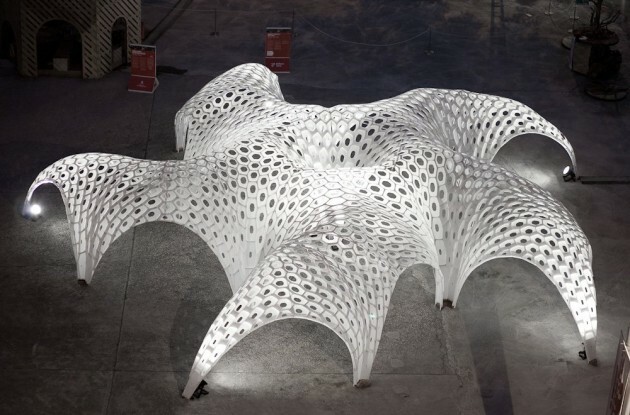 The structure is composed of nearly 1500 individual cells that are all slightly non-planar. 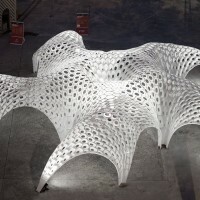 In reality, the cells must bend slightly to take on the global curvature of the form. 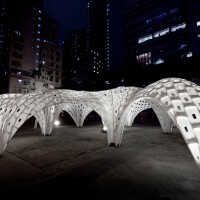 However, the cells cannot be too non-planar as this would make it difficult to cut them from flat sheet materials. 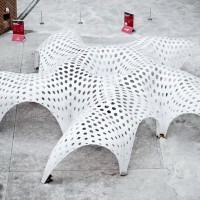 Using a custom Python script, each cell is optimized so as to eliminate any interior seams and make them as planar as possible, greatly simplifying fabrication. 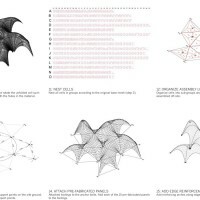 Using more custom python scripts, each cell was unfolded flat and prepared for fabrication. 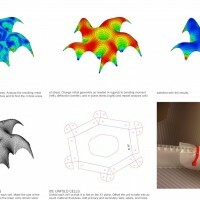 The cell flanges and labels were automatically added and the cell orientation was analyzed and then rotated to align the flutes of the Coroplast material with the principal bending direction of the surface.